The US and EU economic sanctions on Syria are inflicting suffering upon ordinary Syrians and preventing the delivery of humanitarian aid, according to a leaked UN internal report. Embargoes supposed to target President Bashar al-Assad to contribute to his removal from power instead are creating difficulties for transit of foodstuffs, fuel, and healthcare to the populace. Revelations in the internal UN assessment of effects of sanctions on aid delivery titled “Humanitarian Impact of Syria-Related Unilateral Restrictive Measures,” leaked by the investigative publication The Intercept, have opened the US and EU to charges of hypocrisy since Syria and Russia were criticized for impeding delivery of UN aid to besieged Syrian cities. The Intercept quotes an internal UN e-mail by a senior official saying sanctions have been a “principal factor” degrading the Syrian health system; they’ve contributed to price rises of 300% for wheat flour and 650% for rice following a doubling of fuel prices in the last 18 months.Syria was once largely self-sufficient in pharmaceuticals but many production plants in the Aleppo area have been destroyed or rendered unusable by conflict. The e-mail indicates many surviving plants have been forced to close due to sanctions on obtaining raw materials from abroad (and the foreign currency to pay for them). The UN report’s author describes conflict in Syria as the greatest humanitarian crisis the world has seen since 1945; 13 million people, or two-thirds of the population, in need of assistance. The disaster has prompted exodus of at least five million refugees and displacement of four million people internally. It goes further to say chaos has weakened the state and certain conditions have fostered the growth of ISIS.Sanctions are catalyzing humanitarian calamity while Mr. Assad remains firmly in power. Synchronous with the humanitarian crisis is a complex network of non-UN sanctions targeting the government and entities and individuals alleged to have contributed to violence and human rights abuses. The EU has imposed wide-ranging prohibitions on commercial and banking dealings with Syria and controlled export of “dual use” items potentially having some security application while US sanctions extend further– a blanket ban on financial dealings with and export of foreign goods (with US content exceeding ten percent of a finished item’s value) to Syria. Viable means of getting purely humanitarian goods into the country are sporadic if possible at all. 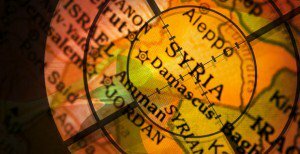 The report cites numerous aid agencies in Syria describing work difficult or impossible by a system of licenses, export controls, and risk management assessments worthy of Dante or Machiavelli; other complications require expensive legal advice to navigate. For instance, the ban on “dual use” goods includes such items as drilling equipment and pipes used for water and sanitation which require a special license – even though a shortage of fresh drinking water is a major health issue in Syria. The big aid agencies universally condemn present sanctions as compounding miseries caused by war. None are named in the report, but a large one from the EU complains of license applications (for sending goods via national government bureaucracies) requiring criteria of which officials there know nothing — compounding delays — while many commercial companies and banks reject business with Syria for fear of unwittingly breaching sanctions punishable by heavy fines. Russian Foreign Minister Sergey Lavrov called on the US and EU to reconsider lifting their sanctions imposed on the Syrian people. “Continuing communications between Moscow and Brussels is a very important issue while cutting them off is shortsightedness,” Lavrov said at a press conference held with Federica Mogherini, the High Representative of the European Union for Foreign Affairs and Security Policy. Mogherini, for her part, affirmed that the EU is ready to “support the process of having normal life back in Syria,” according to RT. Of an estimated 300,000 new cases of childhood cancer diagnosed each year globally, survival rates for children is approaching 80% in developed countries compared to 10% in developing and low-income countries, according to SANA. According to a study conducted by BASMA Association for children with cancer, which provides free treatment to about 650 yearly, up to 50% in Syria are cured amid international concerns over the growth of this non-communicable disease– and an abundance of local challenges including drug shortage and price hikes. Rima Salem, Executive Director at BASMA Association, said the study used data for children between 2009 and 2013 based on the fact that treatment for most common cancers requires at least 5 years to determine treatment benefits. She added that to mark International Childhood Cancer Day (February 15th annually) the association’s campaign this year will launch under the title “Smile has returned” and will include 28 ways to bring focus to pediatric cancer, provide support to children with cancer, and awareness-raising activities in public and private universities. Salem noted there has been a little improvement in medicine availability and is highly appreciative of efforts made by those attempting to bring smiles to the faces of children.Director of the University Children’s Hospital in Damascus Dr. Mazen al-Haddad said the hospital receives up to 7000 children with cancer every year, providing 97% of cancer medicines to patients for free– another high-pressure challenge related to temporary closure of al-Bairouni Hospital and transfer of all cancer patients to the Children’s Hospital. According to Syrian-Australian documentary film-maker and activist Eddie Hanna Gaboro, he learned of cancer cases in the city of Al Qamishly during his trip in July of 2017. He was on a mission bringing aid to and assisting various churches in Syria. Due to sanctions, ten hospitals in operation are still unable to obtain medicine and treatment necessary for their assortment of cancer afflictions. While visiting he was told that methods of deriving diesel fuel from oil heavily polluted the air, drastically increasing the number of patients–90 in Al Qamishly alone–now suffering from certain types of cancer. On International Childhood Cancer day, Prime Minister Imad Khamis visited the Blood, Diseases, and Tumor section of the Children’s Hospital in Damascus. He asserted that the government provides medicines and treatment free of charge to children with cancer. Mr. Khamis encouraged the hospital staff to provide the best medical services and treatment for their cancer patients, stating “the unilateral coercive economic measures imposed on Syria did not hinder the Syrian medical sector from offering all services and needs for patients”. Sanctions meant to negatively impact the democratically elected president of Syria have proven detrimental to civilians, especially when it comes to health and medical needs. What the US and EU have effectively done with their harsh sanctions is make life increasingly difficult for the most vulnerable and innocent members of society. The Syrian government is doing whatever it can to counter these obstacles providing medicine and medical care to the best of its ability. If the US and EU actually cared about civilians, placing human need before strictly-focused agendas, they would ease sanctions directly affecting the majority of civilians. Evidence to the contrary is blatant: their humanitarian guise is nothing more than an excuse to force “regime change” in a war-torn country.